Harrogate Bridal Show - Why Visit? - HBS - Why Visit? The Harrogate Bridal Show is widely acknowledged as the biggest and by far the most important industry event in the bridal calendar. This is where the entire bridal community come together. 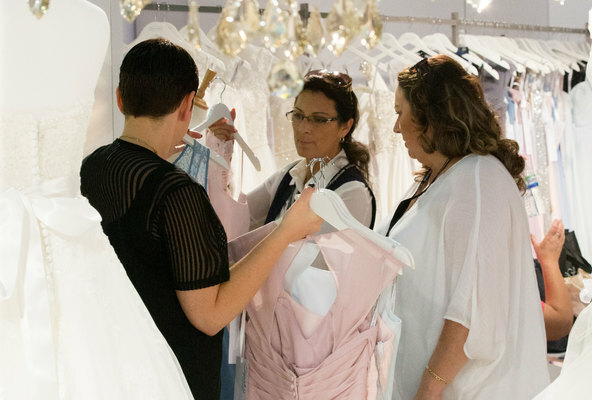 In 2017 3000+ bridal retailers viewed over 350 collections from 180 exhibitors, providing more trend-setting collections, big international brands and cutting-edge labels than ever before. It’s the sheer wealth of choice that sets The Harrogate Bridal Show apart. Contemporary brides are looking for something different to make them stand out from the crowd and in 2017, visitors were able to shop from both established names and exciting new brands, giving them the best chance of setting their business apart from their competitors. During the three days of the show, the picturesque spa town of Harrogate came alive with parties and celebrations! Guests enjoyed a glass of bubbly before the Sunday and Monday evening catwalk shows and celebrated a year of bridal at The Bridal Buyer Awards 2017. With eight halls and three hotels, The Harrogate Bridal Show is one of the largest bridal buying events in the world. Nearly 200 exhibitors showcasing over 350 collections means more variety, choice and opportunities for you and your business. Our state-of-the-art Runways Shows bring next season’s trends to life. See stunning on-trend pieces every day in the Royal Hall, with two different catwalk shows held across the three days of the event. Take a stroll down the Designer Aisle to get up-close with cutting-edge trends from some of the world’s leading luxury brands. We provide a relaxed and professional environment for you to network and form new business partnerships. The Champagne Bar, VIP Lounge and Bridal Buyer Stand are ideal spaces for you to meet, chat and network. During the three days of the show, the picturesque spa town of Harrogate will come alive with parties and celebrations! Celebrate the first day of the show with dinner and dancing at the fabulous BBSA Party, and attend the The Bridal Buyer Awards for an evening of glamour, celebration and entertainment. With over 30 years of experience hosting this annual industry event, we know the things that matter to you. Our decades of experience have created an unrivalled destination to discover the latest trends, source new collections, gain inspiration for the coming season and build new business relationships.